Whether you’re employed at a local business or staying at home with family, it’s great to be productive because it gives you more reasons to live and increase your health condition plus grow your passion and get acquainted with new challenges and new people. 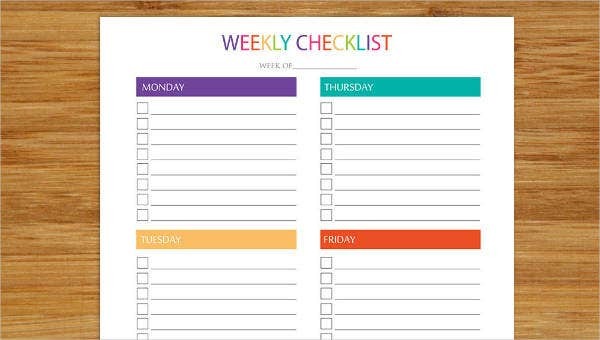 Start becoming the better you by effectively planning your week. 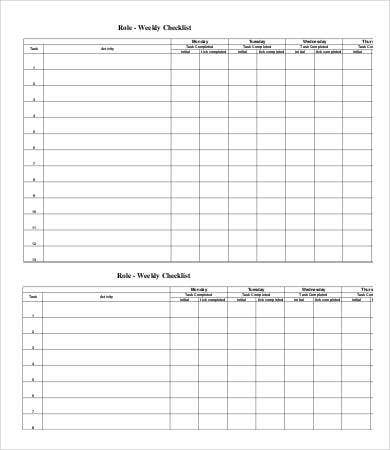 Save time to enrich a hobby, exercise, do chores, spend time with family, or conduct brainstorming sessions with a checklist template. 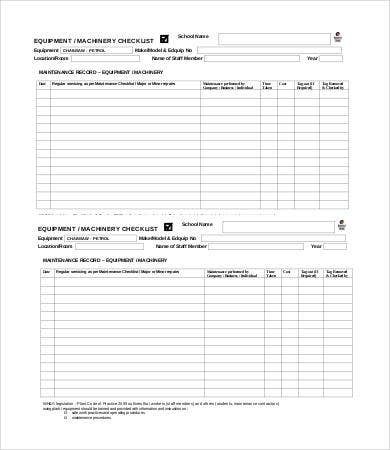 Choose from our neat and elegant weekly checklist templates below perfect for work tasks, sales inventory, cleaning and maintenance operations, and event plans. Losing time. You’ll lack time to do things that will benefit you, like a well-deserved break. Health problems. When you miss out on your break or a good sleep, you’re health declines. Missing opportunities. In compensating time for tasks you should have done before, you’ll miss out on great opportunities, like attending a once-in-a-lifetime workshop of your favorite speaker. Low job performance results. Time wasted breeds negative results for most businesses and employers. Poor decision making. Quality of work could be sacrificed because of lack of time to meet an agenda. Failure to meet goals. This is probably the hardest part. Remember that if you fail to meet a goal, you’ll have to start all over again. Losing momentum. Momentum, according to John Maxwell, is your focus and drive in life. If you procrastinate, then you’ll end up slowing down and breaking the good habits you’ve consistently worked for in the longest time. More crisis. Crisis could mean getting debt instead of profit or getting more things to do than your usual workload. 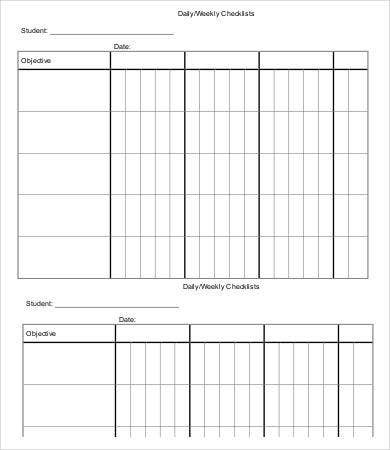 Stop the procrastination by setting a good habit of using our weekly checklist templates such as the blank checklist and daily checklist. 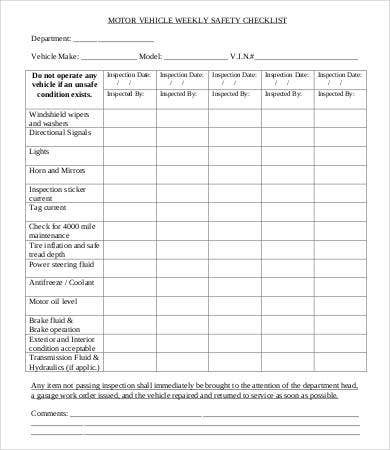 Use this template for checking if your vehicle gears are working properly and see if you have the proper equipment to fix them. 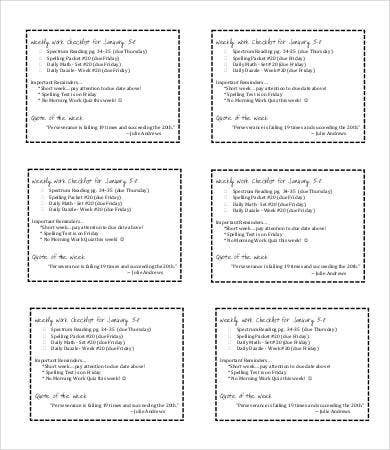 Start by listing your set of gears and supplies you have then determine the status of each. 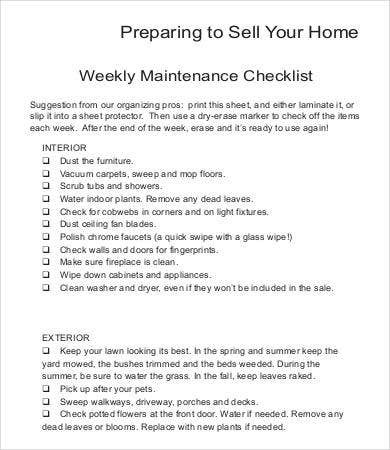 You can list in the remarks section all items that need to be replaced. Before you start cleaning your home, you need to divide areas of your house like the living room, dining room, master’s bedroom, children’s bedrooms, and bathrooms. 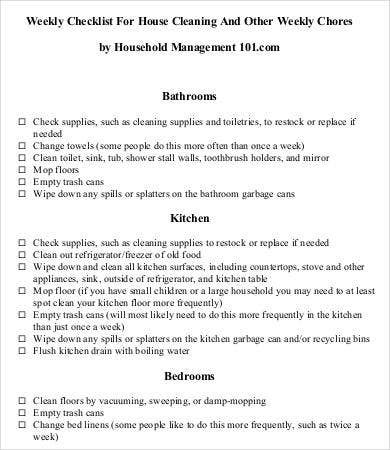 List all cleaning methods that needs to be done in each room and put a check on the box once the method of cleaning is performed. You could be maintaining a garden of flowers or machines and appliances in your office. List down the individual items and determine how many pieces of equipment or flowers are there. Identify how many are broken and place status if items are replaced or will go through repair. Complete ingredients and apparatus needed for your restaurant or home. 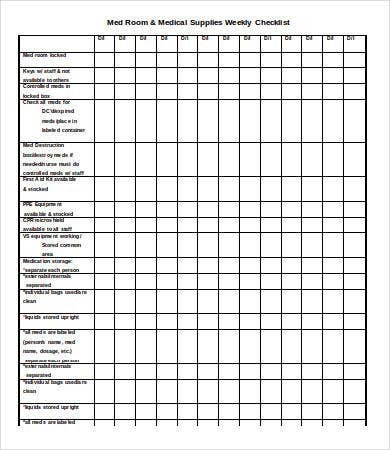 Plan an inventory of items that need to be ordered and determine number of pieces for each using this checklist. 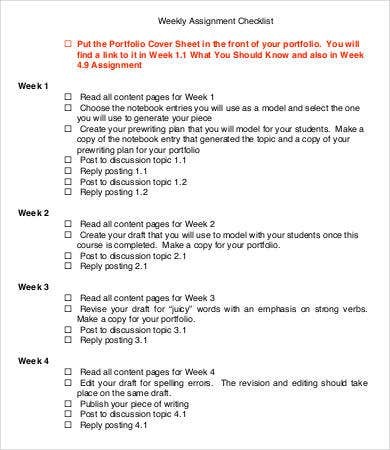 These are just some examples of how to use our checklist templates. 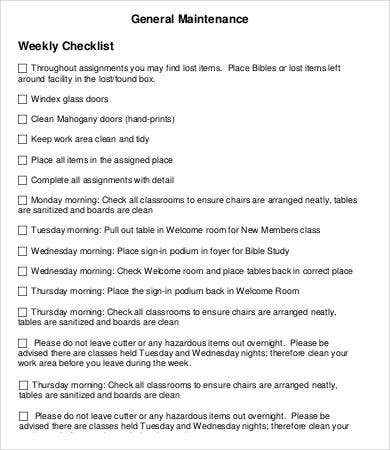 For other specific checklist templates like the Event Checklist, view more of our posts on our website to find the best template for your business.